The F-16 Fighting Falcon's ability to handle tough Suppression of Enemy Air Defence (SEAD) missions makes it one of the cornerstones of the U.S. Air Force today. 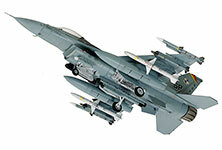 Block 50 evolutions of the aircraft were deployed from 1991 and equipped with an enhanced engine, and F-16CJ were endowed with highly advanced HARM capabilities. The aircraft's hugely varied capabilities were extended yet further via the CCIP program, which endowed F-16s with night fighter functionality and more. 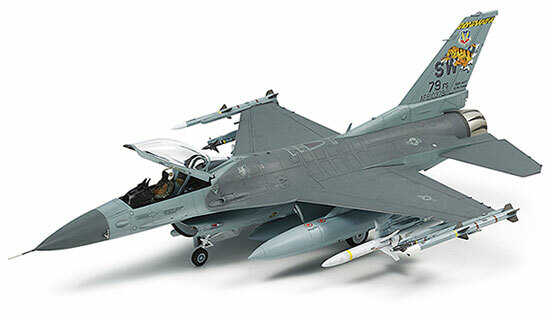 1/72 scale plastic assembly kit of the F-16CJ [Block 50]. ★Fuselage length: 213mm, wingspan: 141mm. ★Aerodynamic form of the aircraft has been accurately reproduced. ★The model provides an intuitive assembly process without sacrificing detail. ★CCIP program improvements such as Sniper XR Pod and IFF antenna at the front of the cockpit are faithfully recreated. 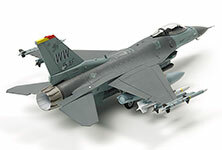 ★Comes with parts depicting a wide range of accessories including AIM-120C and AIM-9M/X air-to-air missiles, HARM missiles, ECM pod, 2 types of fuel tank and more! ★Realistic seated pilot figure, plus 3 marking options are included. 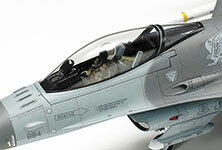 ★The sleek form of the F-16CJ Block 50 is succinctly captured in easily displayed 1/72 scale. 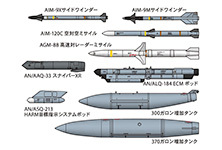 ★With a wide range of ordnance parts to attach, your model with be brimming with realism. ★Click on this image for a closer look at some of the ordnance and other accessories recreated in this kit. 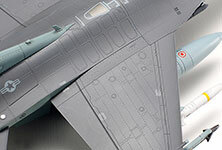 ★Kit offers superior detail, the flowing lines and fuselage surface patterns of the aircraft authentically depicted. ★Choose between an open or closed bubble canopy when assembling. Pilot figure enhances kit realism. 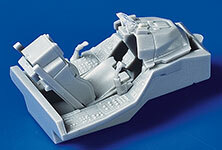 ★Excellently-molded cockpit interior doesn't shirk on the details, depicting points such as instrumentation.